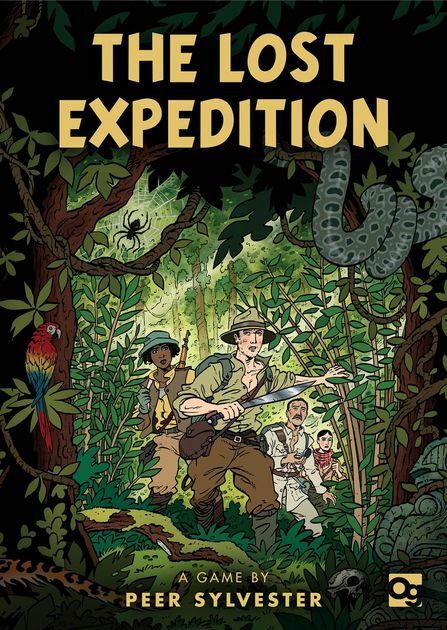 When I first saw the box cover for The Lost Expedition, I was pretty excited because it had a throwback comic style that I really like. Also, it’s an adventure game so I knew there was a pretty good chance we’d enjoy this one. This Lost Expedition review is based on ~15 plays. What is The Lost Expedition? 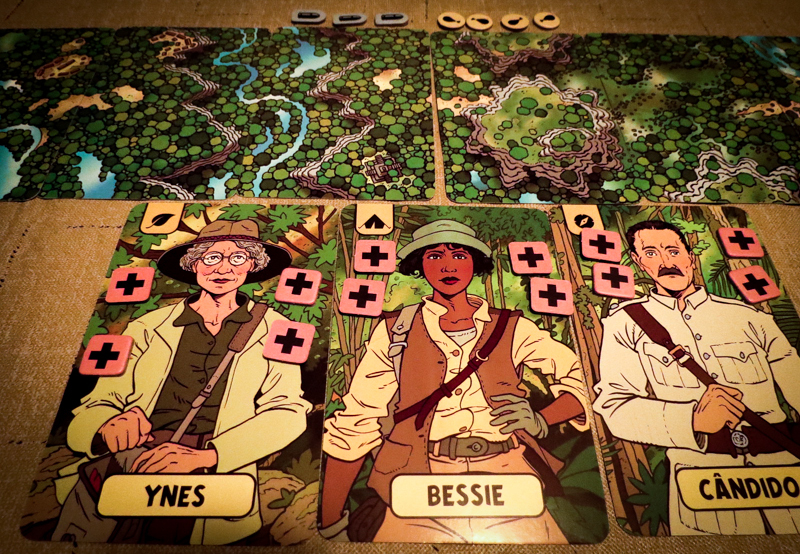 In The Lost Expedition, you will be playing as three explorers attempting to find El Dorado (aka the lost city of Z). Along the way you’ll be dealing with different types of encounters, hoping to make it to the end of the trail. This game can be played solo, co-op, or as a two-player competitive game. The Lost Expedition was designed by Peer Sylvester and published by Osprey Games. I’m only going to go over the cooperative mode in this gameplay overview, but there are only slight changes that need to be made when playing the other modes. To set up the game, you will place your three explorers out on the table and give them their health tokens. You’ll also lay out 7-9 expedition cards, which represent the distance you’ll have to go to reach El Dorado, and place your team’s meeple on the first card. You will also get some starting food and ammunition. The Lost Expedition is very easy to learn once you understand all of the cards’ symbols. That’s actually not too tough to do since there are a total of 12 symbols in the game. When these symbols are filled in / black, that means you’ll gain those items. When they’re not filled in, you’ll have to spend those items. Events (yellow) – You’ll always have to respond to these. Choices (red) – You have to respond to exactly one of these. Options (blue) – These are optional. The resources in the game are food, ammunition, and health. Food is needed to feed your explorers in the mornings and evenings. 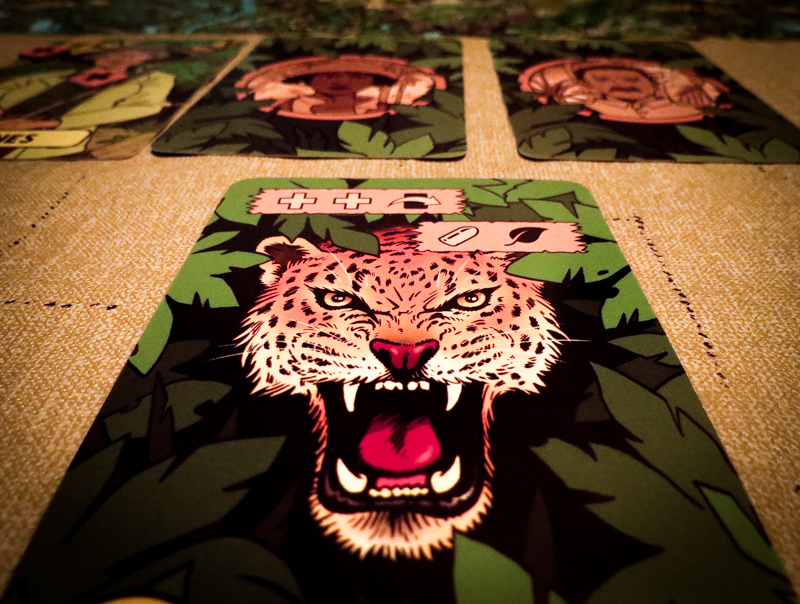 Ammunition is used to fight off the animals you’ll run into in the jungle. You need your health to stay alive! The expertise symbols you’ll see are Jungle, Navigation, and Camping. These are found on the explorers’ cards and on some of the adventure cards. There are ways to gain these symbols by responding to certain adventures. Each explorer has one of the three expertise symbols on their cards, which means they lose a health token when you don’t have an adventure card with that symbol. There are also four Path symbols, which affect the adventures cards in different ways. These symbols can be used to skip cards, swap cards, remove cards, or even add cards to the path. Part of the strategy in this game is knowing how to line up the cards in a way that allows you to skip or remove the toughest ones. The last two symbols you’ll see are the Advance and Death symbols. Advance is extremely important because it allows you to move closer to El Dorado. The Death symbol instantly kills one of your three explorers. During the Morning phase of a round, you will be playing adventure cards from your hand to the path. The first player will play their card, then the next, and so on. In this phase, the cards are kept in numerical order. After that, you’ll simply go through the adventure cards, responding to the Events, Choices, and Options. The Night Phase is exactly like the Morning phase except that the cards will stay in the order in which they’re played. Players can talk about how they want to approach each phase, but they can never talk about the cards in their hands. The key is to keep your resources (including your health) as high as you can as you move closer to El Dorado. If you make it to the lost city, you win! If all three of your explorers die or you go through the adventure deck twice, everyone loses. Everyone I’ve played this with has loved the art style. It has a classic cartoon style, but it also does a good job of bringing home the adventure theme. This is a new take on the resource management mechanism. Do you use your precious bullets to get some food, or do you sacrifice some health to move closer to the lost city? It’s a cool puzzle that changes from round to round. Every game mode works very well. Solo gamers should love it, and it’s pretty great that you have the option to play a legitimate 1-on-1 game if you want to change it up a bit. The Lost Expedition is perfectly challenging, even at the “normal” difficulty level. It’s definitely winnable, but it’s tough having to constantly adjust to the cards that hit the table. I probably made the game seem more complicated than it really is, but it’s actually extremely easy to learn and teach. I taught six people how to play The Lost Expedition and it never took more than five minutes. The card quality is fantastic. They’re larger cards, but they feel great in your hands, are easy to shuffle, and the images pop off of them. The explorers all have similar blank expressions on their faces. These character cards are always visible, so it probably would have been better had they been given a bit more personality. We don’t mind how the game ends when you win, but it would have been pretty cool had they added a some kind of final showdown after you reach the lost city. Instead, it’s just over when you reach the final card. Again, not a big deal. The Lost Expedition is definitely a keeper. 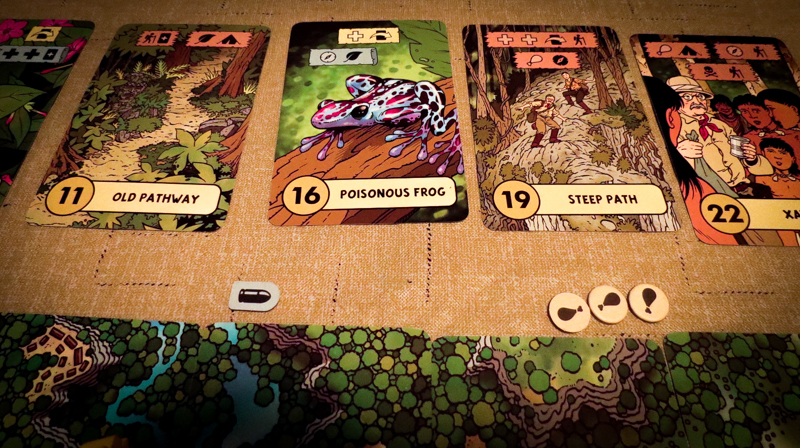 It’s a relaxing adventure tabletop game with a clever resource management mechanism. Solo gamers will probably love it, co-op fans will definitely like it, and its head-to-head mode is nothing to sneeze at, either! If you’re looking for a quick adventure game to add to your shelf, definitely check out The Lost Expedition. It’s a simple game to understand, but I have a feeling it will take a while to master. Thanks for taking the time to read our The Lost Expedition review! And thank you to Osprey Games for providing us with a copy of this game.